Even before the government completes its policy review, the vice president says transgender members of the military are qualified to serve openly. 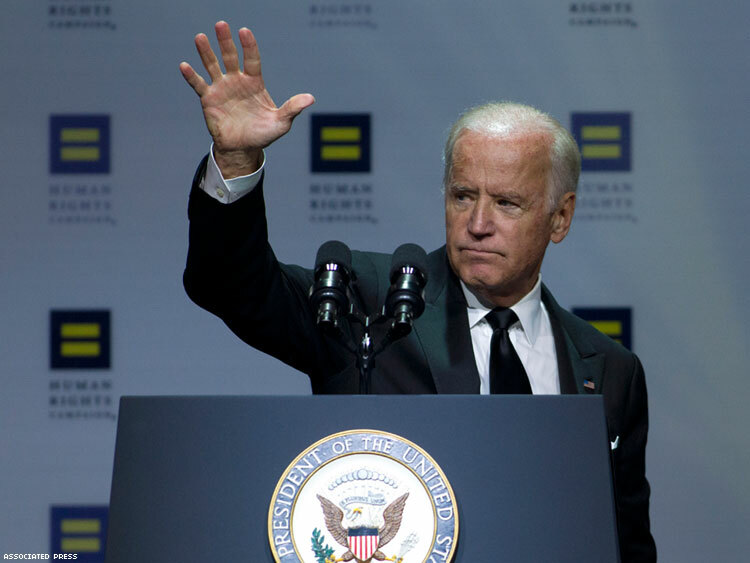 Vice President Joe Biden is once again skipping ahead of President Obama in his support of an LGBT policy advance. The Obama administration is still in the midst of a policy review on whether transgender service members ought to be allowed to serve openly, or whether they must continue to face expulsion. But Biden, during a speech on Saturday at the Human Rights Campaign's annual gala in Washington, D.C., is already offering his unqualified support for open service. "No longer is there any question: Transgender people are able to serve in the United States military," said the vice president. "It's simple," he said, "all Americans who qualify to serve physically should be able to serve." HRC President Chad Griffin had appropriately introduced Biden to the crowd as, "Someone who has been known to be a little impatient when it comes to doing the right thing." He was making a coy reference to Biden having supported marriage equality before Obama, who was planning to announce his backing as part of the 2012 reelection campaign. Earlier on Saturday, Hillary Clinton also made her support clear for open service by transgender members. In a speech ahead of the gala to HRC volunteers, the 2016 candidate said transgender people are serving now and "keeping this core part of their identities under wraps because they are so committed to defending our nation. They shouldn't have to do that." "Transgender people are still banned from serving. That is an outdated rule, especially since you and I know there are transgender people in uniform right now. They are just keeping this core part of their identities under wraps because they are so committed to defending our nation. They shouldn't have to do that. That's why I support the policy review that Defense Secretary Carter recently announced at the Pentagon. And it's why I hope the United States joins many other countries that let transgender people serve openly. Now we pride ourselves on having the world's best military. But being the best doesn't just mean having the best trained forces or the biggest arsenal. It also means being a leader on issues like this, on who we respect enough to let serve with dignity as themselves." Meanwhile, Bernie Sanders has already signaled his support for repealing the ban on transgender service members. Sanders was asked about the ban by a transgender soldier during a chat on Reddit and said, "As somebody who has consistently voted to end discrimination in all forms — who voted against DOMA way back in the 1990s — I will do all that I can to continue our efforts to make this a nondiscriminatory society, whether those being discriminated against are transgender, gay, black or Hispanic."